Welcome everyone to my thread on the progress of building Lumbridge Castle, from the game Runescape. Let me tell you a little bit about myself first. I started Minecraft about a week ago and am currently using a cracked version, I'm going to be honest. I'm unable to buy the game for many reasons, but I don't want to get into that. I'm really falling in love with playing it, so I decided to make a project to keep myself busy. The only downside about this project is the fact that if I so happen am able to purchase the game, then all of my progress will most likely have to be restarted, but I highly doubt I'd be purchasing it anytime soon. If I do however get the actual version of minecraft I'm going to try to look into building whole cities of Runescape. Now on with the project! 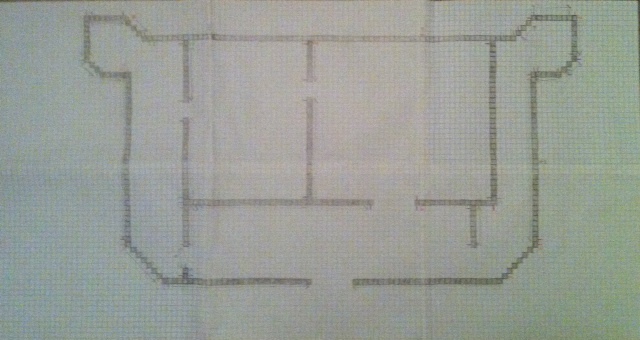 I scaled out the base of the castle on graph paper. I didn't want to use any programs on my computer, because I simply want to have fun drawing everything out myself, and possibley having gigantic map of the areas I have built. I'm most likely going to start out by building the base, and then see what height I want it, and then scale the 2nd and 3rd floors on paper. It is 22 x 15 inches. Updated - 7/3/2012 : Day 2. 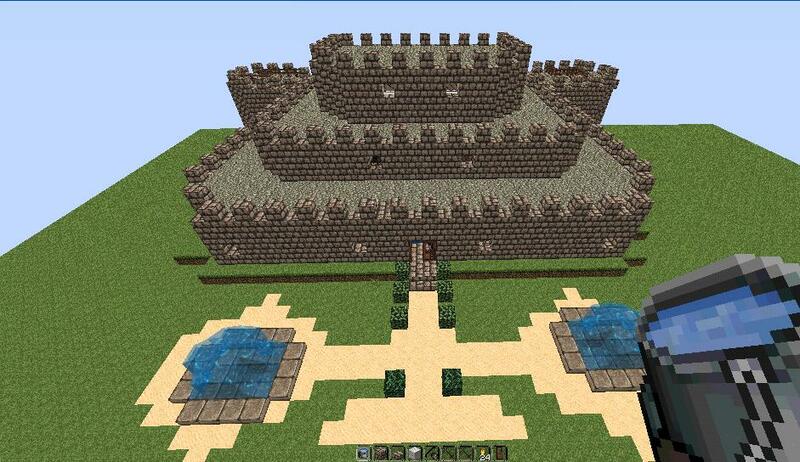 I built the base, roof, 2nd floor towers, tower spiral staircases, and the outline of the kitchen, and dining room. Updated - 7/4/2012 : Day 3. 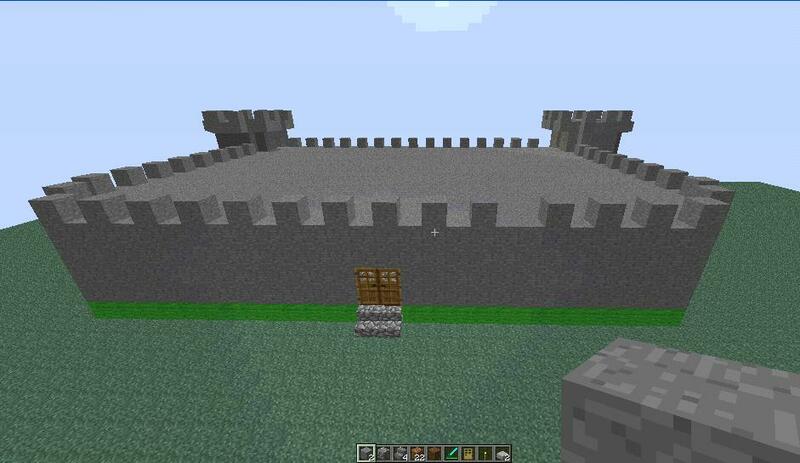 I forgot to mention that I used stone for the outline, because I needed to double up for the interior of the castle (walls). 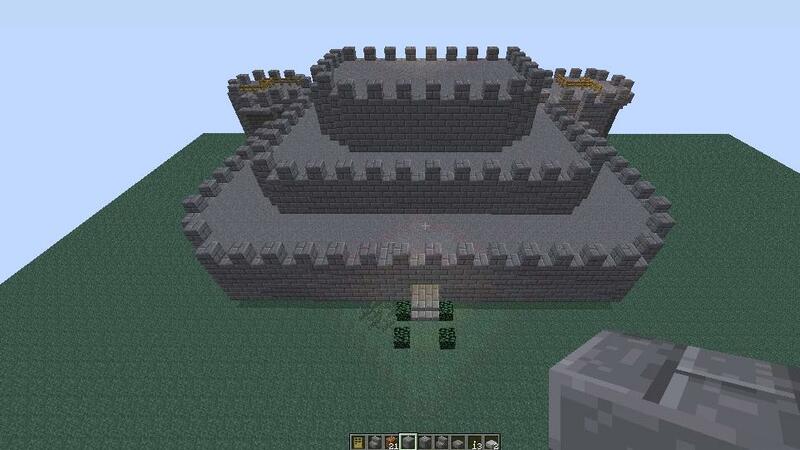 I finished most of the castle, and gave it the stone brick finish. Next I'm going to focus a bit on the details, and then start the plans for the courtyard. Later today I added a new texture pack. 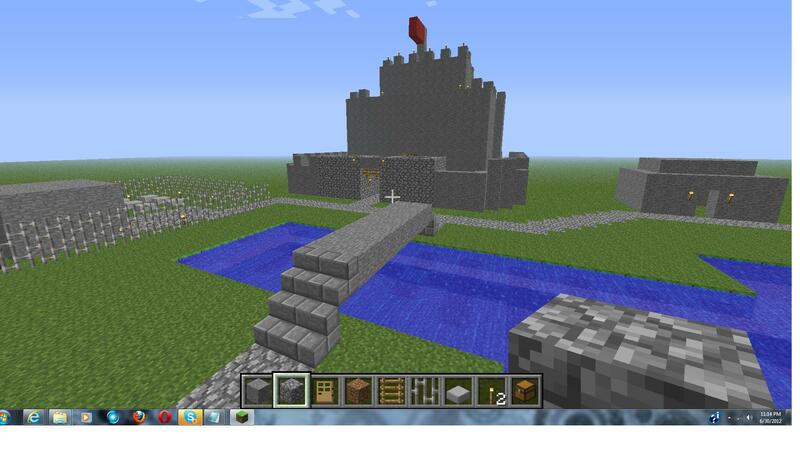 I also made the fountains and part of the pathway. The entire inside has been decorated with white walls with wood bordering and windows. Looks like that plan shows you know what you are doing. I assume you're also going to do the basement and the courtyard/spawn too? That would be quite cool. Optimal room height would probably be 3-4 blocks high max. Also instead of (what appears to be) a slightly off scale map (which is still pretty good) you could use one RS square = one MC block. This way you have a close enough scale and also makes it easier to put doors in (because all the doorways are 2 squares wide aren't they). Anyway, hope to see what this looks like when it's done. Wake up on an island. Punch some trees. I am planning to do the basement and court yard! I'll ahve to scale those out as well. Thank you so much for the tips, I was looking at it more like "one RS square = one MC block. It does look too me that I might have scaled it to be a bit too large so I think I see where you were looking. If you buy Minecraft your progress will not be lost. Just backup the save file: Hit start and type %APPDATA% and then enter (include the %). Click roaming, then .minecraft and then saves. There are your saves ready to backup! (just copy them elsewhere). Anyways, I think you are going to have problems with the banners. I suggest texturepacks to modify paintings into banners. But nice project idea ma'te! Thanks for the information! I'm unable to buy minecraft so I'll have to wait for Christmas or something haha. Ah, I remember creating my RS account 5 years earlier. I probably don't play it anymore, but I say you should get started on that ground floor, and maybe later that basement. The Castle actually looked simple enough to build. Good luck! 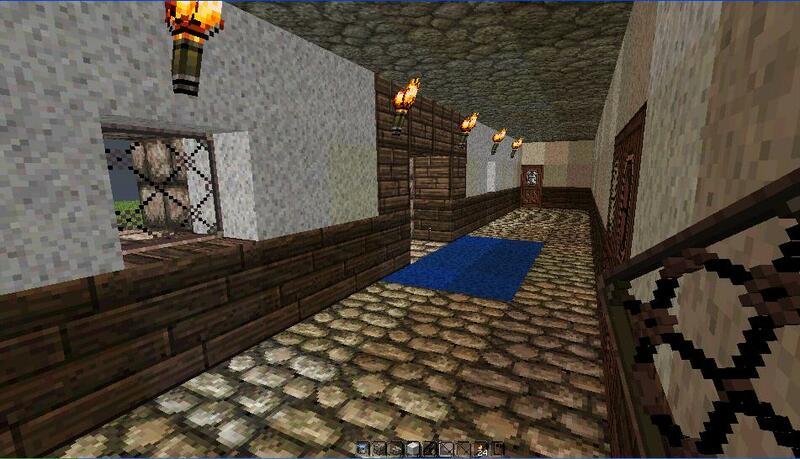 The walls should be made out of stone brick and the floors should be made out of cobble. I really have no idea how I got curse premium, because I didn't subscribe to it rofl. I used to love Runescape. Having a cracked version of the game is illegal. Reported to the cyber police. Thats probably the only explanation possible LMAO. I don't have a credit/debit card, and I have no money at all so I seriously have no idea. I thought it was there for everyone, because when I clicked on it, it prompts me to subscribe to them.... I'm also on the Zybez forum to where I am not a premium member. Anyways, this is getting way off topic. You guys are really not being intelligent. You don't have to crack the game to play offline. Anyway, nice choice for a build. Simple, yet recognizable. May I suggest cobblestone for the cannon body, a dispenser for the head, and trapdoors for the wheels? Haha I remember when I played Runescape, I suggest you use Stone Bricks instead of cobblestone. anks for the suggestion, I truly appreciate it! Do you have any idea where I can find some what of a flat land mod for creative mode? Thank you, I'm a 138 in Rs haha. I'm going to go to bed after this post, but in the morning I'm going to attempt to recreate Lumbridge castle. It should not be hard at all since RuneScape is also has a graph-based map system. Survivance, just Google for a Minecraft flat grass map. There are lots of good ones out there.